What, you hadn't noticed this game was coming out? You live in a cave with no internet access? 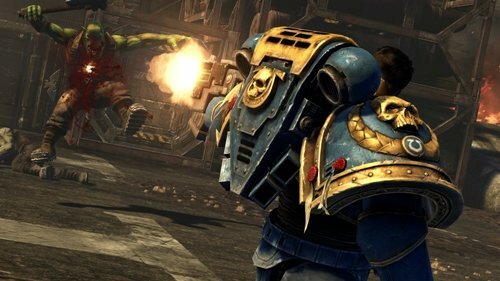 I've really enjoyed the Dawn of War series of games and even a few of the others like Fire Warrior and Squad Command so when I saw this one was being offered I couldn't resist. A quick trip to Steam and a preorder had me playing the two demo levels and eagerly awaiting the full game to unlock. Was I happy with it? Just click below to find out. And in case you don't like suspense, or have a weak heart, yes I liked it. My painting table will sadly gather dust for a while. I guess this was actually something I got started on last winter, but became a side project. Something to paint and occasionally play with the kids. Suddenly there is interest in it from the rest of the friends I game with. My rag tag band will be joined by 4 more armies shortly, and I've picked up the pace on painting mine. I've got Fletcher's army, about 35 points of Menoth. Some Cygnar. OK, a lot of Cygnar thanks to ebay and the FLGS consignment case. They are going to be up against some more Cygnar, some pirate mercenaries, and two as yet undecided armies. We've had a few games, so far I'm 2:2 on win loss, but most importantly this has been a big help to learning the rules. I've won with Khador (against Cygnar), won with Menoth (against Khador) and lost twice with my mercenaries (against Cygnar both times). Last nights second game was a lot of fun and pretty close. I was busy destroying his army, and probably would have had him knocked out in one more turn as all he had left with three troops and a crippled jack. He'd managed to injure my warcast earlier though with a lucky shot from his Defender warjack. 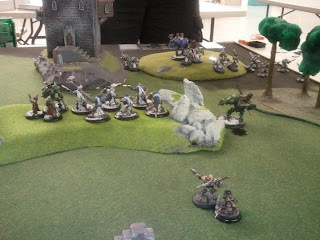 He pulled off a flank with his warcaster and managed to get a shot on mine. Coupled with the earlier damage it was enough to drop him. I think we'll be mixing in quite a bit more Warmachine in the future. Now I have a better understanding of the rules I'd like to get my kids back playing it (rather than just playing with the minis) as well.